On 8th November, some 30 people gathered for an event in the Guildhall, London, hosted by the Association of Charitable Foundations,on how Charitable Trusts and Foundations can use social media. 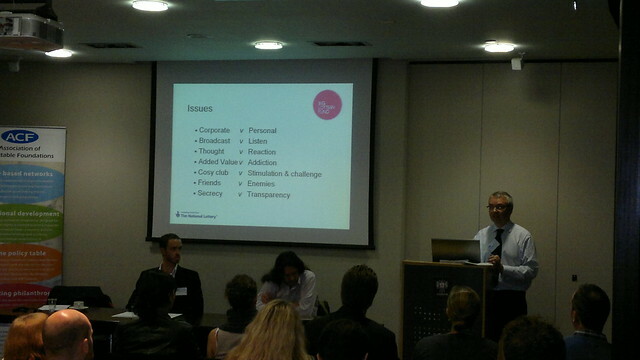 Speakers were two Chief Executives in the sector who have become well known for their use of social media for both personal and professional reasons, Toby Blume, of Urban Forum, and Peter Wanless of the Big Lottery Fund. Both speakers gave an interesting insight into how they blend their personal and professional profiles to engage people using social media. Toby gave the audience a tour through different social media tools, outlining his 5 C’s of how social media can add value to an organisation’s work: Connection, Collaboration, Commerce, Campaigning, and Communication. Toby communicated the message that no organisation can ignore social media channels today, particularly through the story of the United Airlines passenger whose guitar was broken by baggage handlers, and who released a song about the experience on Youtube which resulted in 180 million dollars being wiped off the airline’s stock value in four days, and which, to date, has had over 11 million views. From a personal point of view, Toby recounted how a tweet questioning the official publicity about banks channelling money through Big Society Capital led to him being interviewed on Radio 4’s “Today” programme. Peter Wanless talked about how his own use of social media started almost accidentally, and happened well ahead of its adoption by his organisation. Peter believes his own social media use, and the example it set, both allowed him to push for its wide adoption by the Big Lottery Fund, and gave staff within the organisation confidence to experiment themselves. He admitted to initial nervousness among some staff at the way social media communication subverted some of the hierarchical relationships, but he believes that BIG is on it’s way to becoming an open, sharing organisation, which is setting an example to others. He illustrated this by describing how photos and messages from the National Lottery Awards ceremony on the previous Saturday evening were released live on the web from a number of sources, when, in earlier years, it would have been a case of carefully managed press releases going out on the following Monday morning. Expressing a sentiment which is common to many social media users, Peter described how he has reluctantly come to accept the widely-held view of him as the “tweeting Chief Executive”, as he feels that he is on a constant learning curve. Here is Peter’s presentation. A lively question and answer session followed. Audience members were particularly interested in how small organisations could adopt social media when they have few resources or staff. Peter’s response was that he does most of his tweeting on the train to and from the office, when he would otherwise be bored or reading the newspaper, and he no longer needs to buy a newspaper because he gets all his news from Twitter. Toby suggested that social media should not be seen an additional burden, but that it can streamline processes and replace out-dated practices. Thus, he also no longer buys a newspaper, sends and receives a lot less emails, and blogs instead of writing policy papers. Another issue concerning attendees was how to persuade trustees, many of whom are older people, that social media was a legitimate use of time and resources. Gentle introductions to the tools were suggested, and an approach which seeks to tie in with trustees’ personal interests. Toby suggested that the United Airlines video could be a powerfully persuasive tool. As the event wound up, I caught up with both Peter and Toby for interviews about their impressions of the day. There seemed to be a lot of positive intent in the room to go away and apply the practices described by the speakers, and there were clearly some of those present who already had stories to tell. As David Wilcox and I have advocated elsewhere, one of the keys to successful social media use is the ability to tell compelling stories. Charitable Trusts and Foundations have lots of stories to tell about the differences they have made to the lives of individuals and communities, and, social media can provide them with platforms via which to tell such stories which can be far more compelling and engaging than dry and dusty reports which sit on shelves unread. As we progress through the work that the Social Reporters team is doing with the Big Lottery Fund, we are getting much support for this approach, and hope to see it much more widely adopted in future. Hi John, thanks for this! Great stuff. Just a slight clarification on what I meant when I was talking about spending time differently – not just ‘more’ work. I still write policy reports….I just don’t read the publications that are sent in the post, as I have already seen then online.